Here is how to receive the signals each day from the strategies in Buy the Fear, Sell the Greed. 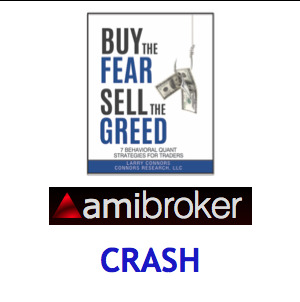 If you are an AmiBroker user, we have programmed the add-on code for CRASH from Buy the Fear, Sell the Greed. The AmiBroker Add-on Code will allow you to use the Explore button in the Analysis window to scan a universe of stocks each evening for trading signals for the next trading day. The signals will include entry, exit, and entry limit price information, if appropriate for the strategy, which you can export for further review. What Do The Scan Results Look Like? The signals will include entry, exit, and entry limit price information, if appropriate for the strategy, which you can export for further review. To run the AmiBroker explorations requires AmiBroker version 6.2 or later and a data source that provides daily data. Our research team uses data from Norgate Data that is adjusted for splits and dividends, but you can use any data source that you consider reliable. Please note: This code is not designed to allow you to backtest the Buy the Fear, Sell the Greed trading strategies. It provides you with the trading signals for the upcoming trading day. Please Note: This purchase provides you with the AmiBroker add-on code for the CRASH strategy only. If you would like to purchase the AmiBroker add-on that contains the entire set of seven Buy the Fear, Sell the Greed strategies for $125, click here.